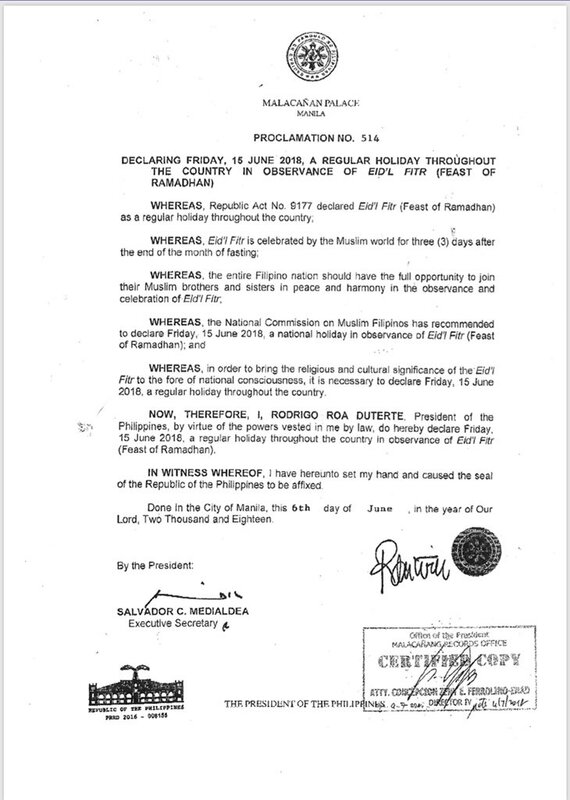 MANILA, Philippines – President Rodrigo Duterte on Wednesday declared June 15, 2018 (Friday) a regular holiday throughout the country in observance of the Eid’l Fitr or end of Ramadan. Duterte signed Proclamation 514, according to Special Assistant to the President Christopher “Bong” Go. This means that Filipinos will have a long weekend this month from June 15 to 17. READ: Proclamation No. 514 declaring June 15 a regular holiday nationwide. According to Proclamation No. 269 for the nationwide holidays for year 2018, the National Commission on Muslim Filipinos (NCMF) shall inform the Office of the President [ President Rodrigo Duterte] of the actual date of Eid’l Fitr and Eid’l Adha on which these holidays shall fall. RA 9177 states that "the approximate date of these Islamic holidays may be determined in accordance with the Islamic calendar (Hijra) or the lunar calendar, or upon Islamic astronomical calculations, whichever is possible or convenient." While the exact date of Eid Al Fitr is already known and looking further down the calendar, Eid Al Adha will most likely to fall on Wednesday, August 22.